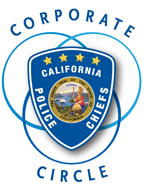 We are proud to announce the newest resource for law enforcement in California, the California Police Chiefs Association Corporate Circle Program. Designed to provide our members with a single online resource, the Corporate Circle Program is the ideal vehicle to market your organization to a member base that spends over half a billion dollars per year on equipment and services. For more information click HERE. Click HERE to sign up.